In light of the Queer Trans Coalition’s recent post questioning the accuracy and intent of the article “The Queer Community Has Let Us Down,” City on Hill Press recognizes the mistakes in our reporting and editing process. There was a lack of analysis and connection made between the oppression of trans people and trans people of color by UCSC and the state, and the queer community and Pride events. There was no mention of the queer and trans community’s continual fight for all-gender restrooms and against police violence, the lack of support staff for trans students and the lack of representation among UCSC administration. The article has been updated with more specific details about the oppressions the trans community faces and the ongoing work of the Queer Trans Coalition. We recognize that our coverage of the protest was problematic and contributed to the lack of representation and misrepresentation trans students face on our campus. We appreciate students who are willing to change the conversation and challenge media, including City on a Hill Press. 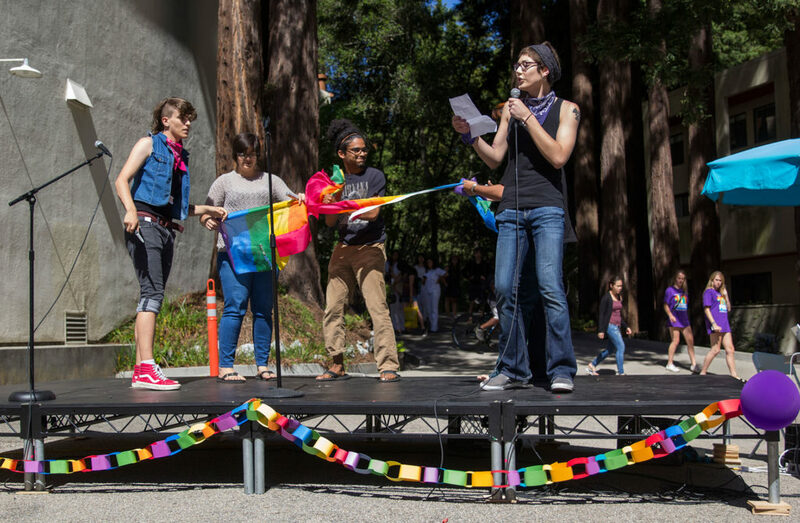 Read the UCSC Queer Trans Coalition’s full statement regarding the CHP story here. Kresge Presents PRIDE, a daylong festival complete with rainbow balloons and performances from a variety of student organizations, is meant to be a celebration recognizing the historical accomplishments of the LGBTQ community. But protesters at Saturday’s PRIDE argued that pride celebrations have become increasingly commercialized and exclude people who identify as queer or trans as well as queer and trans people of color. Organized by the Kresge Multicultural Education Committee and the PRIDE Committee, the 10th annual event featured a two-hour march followed by a festival held on Kresge Lower Street. Many students participating in PRIDE voiced their appreciation for a space that allows them to celebrate their identity and LGBTQ culture. The members of the Queer Trans Coalition have a perspective that they say goes often unnoticed — not just at the university, but nationwide. The Queer Trans Coalition — a group that formally rose out of the town hall meeting with Chancellor George Blumenthal in response to the Kresge hate crime and Title IX investigation — protested against Kresge PRIDE and the idea of celebrating a community that continually experiences struggles that go unacknowledged. Students have had to lead activism for virtually all issues affecting trans students, including all-gender multi-stall bathrooms, a trans resource center, a trans specialist and safer housing for trans students.These are all concerns that have been voiced by students but have yet to be directly addressed by administration. Rose said Pride celebrations have increasingly become centered around gay marriage, while leaving out conversations about oppressions trans people of color face nationwide. She said the exclusivity of Pride events too similarly mirrors the way trans people of color are continually silenced by entities on the university, state and nationwide level. Although the Queer Trans Coalition was formed during an event that addressed violence against trans people on campus, it also works to address the inadequacies of public policy in regard to the protection of trans people and trans people of color around the nation. In the first month and a half of 2015, seven trans women were murdered, compared to the 12 deaths of trans women in all of 2014. In a recent report conducted by the African American Policy Forum, 38 percent of black trans people have reported harassment in interactions with police. Fourteen percent of black trans people have reported assault and six percent reported sexual assault. “I can’t feel safe at PRIDE,” Rose said. During Kresge PRIDE, Rose said her transgender sister from the coalition was sexually assaulted at their table. Kresge PRIDE adviser Omar Aziz said Kresge Resident Life, the Title IX Office and campus police are currently working together, but no official report has been submitted to campus police or the Title IX Office. UCSC police Chief Nader Oweis said inquiries have been made, but the victim has not been identified and there is no further information regarding what happened. Protesters took the stage and began to tear the pride flag in half. Photo by Casey Amaral. Chair and associate professor of feminist studies Marcia Ochoa said protesting is an important aspect of LGBTQ culture because that’s how social movements are formed. Ochoa said people should be concerned about how the trans community has been affected by recent events on campus. Yet the coalition confronted PRIDE participants and said the event is a celebration of a battle that the LGBTQ community has yet to win. Kresge PRIDE organizers said they didn’t anticipate the appearance of the coalition and had a hard time responding to its opinions, but they understood there has been a lack of visibility of the transgender community on campus. Coalition members took the stage at the festival to express that the queer community has let them down. Before members of the coalition left the stage, they defaced the rainbow flag by writing “assimilation” over the bright colors, tearing it apart with a knife and throwing the debris in the air. Rose said confronting the community was a “cathartic moment” for her. For two years on campus she has been “civilly” organizing with various resource centers like the Cantú Queer Center, but she has not seen much change in policies that affect the transgender community. During the march, Rose said the coalition posted toilet signs on bathroom doors to “degender the spaces” and help make such spaces more inclusive for trans students. She explained that marking restrooms “man” or “woman” upholds the gender binary that perpetuates violence against women and people who are trans. Last fall, UC President Janet Napolitano announced the UC-wide conversion of single stall restrooms to all-gender restrooms, but allocated no funding leaving universities — and often student organizers themselves — to come up with the money. For the first time, Rose is beginning to see around campus that people are recognizing and discussing the issues surrounding people who identify as queer or trans as well as queer and trans people of color.